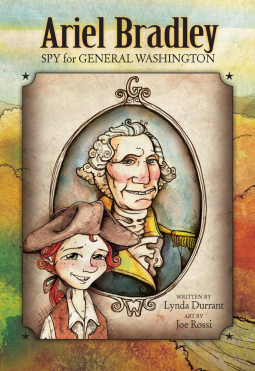 Today’s book review is for Ariel Bradley, Spy for General Washington, written by Lynda Durrant, illustrated by Joe Rossi, published by Vanita Books. I received an electronic copy of this book through NetGalley in exchange for an honest review. Ariel Bradley, Spy for General Washington is an early chapter book based on the true story of a 9-year-old boy who was recruited by George Washington to act as a spy during the American Revolutionary War. When his older brothers come home on leave, Ariel is asked if he can play the “Johnny Raw” (country bumpkin) for General Washington. So begins Ariel’s adventure, where he must enter enemy encampments to gather information about troop numbers, weaponry, horses and conditions–all while pretending to be a country bumpkin in search of a flour mill. Exciting and entertaining, school children are sure to connect with Ariel, and learn some American history along the way. Durrant does a wonderful job at drawing readers into the story. Rather than get bogged down in descriptions of setting, she opts to instead focus on events and character. I liked this tactic–it kept the story moving forward and didn’t allow time for the mind to wander. Another thing that I enjoyed was that throughout the text, we get to experience Ariel’s confusion, doubts, and fears. Even though he was doing something very important and brave, it was also dangerous. 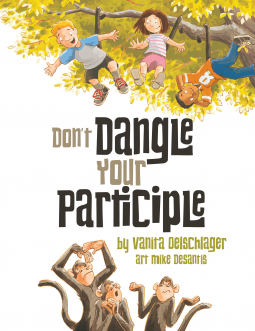 By sharing these insights, Durrant let’s children know that it’s normal to be plagued by doubts and fear, even when you’re doing the right thing. Rossi’s illustrations are a lot of fun. He blends a modern chariacture-inspired cartoon style with layers of watercolor and digital aging techniques to produce dynamic images. In this way he is able to appeal to his young audience while also capturing the sense of looking back at the past. Rossi is particularly adept at rendering facial expressions in his work. My favorite picture was one of British General Howe, looking particularly stuffy. The book closes with an afterward detailing additional history about the real Ariel Bradley and what happened to him after his stint as a spy. It also include a short glossary of terms that children might not have known before reading. It’s a nicely designed book–from layout choices to font selection, it has an attractive, high quality appearance. I think that Ariel Bradley, Spy for General Washington would make an excellent addition to schools and public libraries. It gets 4 out of 5 stars, for strong educational value and solid kid appeal. Plus, it helps show children that they do, in fact, have the power and agency to shape the course of history. Today’s book review is for Magic Words: From the Ancient Oral Tradition of the Inuit, translated by Edward Field, illustrated by Mike Blanc, published by Vanita Books. I received an electronic copy of this book from NetGalley in exchange for an honest review. Magic Words is from a story that Knud Rasmussen recorded in the 1920s when he visited the Inuit. Many of the stories and legends in his papers were recorded verbatim. In the 1960s, Edward Field translated a number of these texts into English for a collection. Field’s translation is elegant in its simplicity and preserves the feel of the oral storytelling tradition. His writing is clear and direct, yet still carries a sense of wonder and magic. He shares a tale of ancient times when humans and animals all spoke the same language, when they could change their forms at will, and when magic was still alive in the world. It’s a story that should capture the imaginations of young readers, while at the same time exposing them to the beliefs and culture of the Inuit. The text is accompanied by gorgeous digitally colored pencil drawings by Blanc. It is obvious that he has studied Inuit art in order to create these illustrations. He uses flat outlines, which call to mind Inuit art tapestries, as well as the planed faces common to their sculpture. These traits are then softened through the digital coloring to add a fuzzy feeling of the distant past. The elements all pull together to create a distinctive mood within a specific cultural context. The overall design of the book is quite lovely–with even the fly leaves being illustrated. The placement of text on the page is thoughtful–and it varies according to each illustration. I thought that the Coraline font worked well on the page, complementing the artwork while remaining quite readable. The only thing I didn’t really like is how the letter “y” has its tail backwards. I would love to own a physical copy of this book; I think it would be perfect for my daughter’s collection. I’ve already recommended it to my father-in-law who owns and operates a gallery dealing with contemporary Artic, Inuit, and American Indian artists. I also plan to mention it to the children’s librarian at my local library. This book earns 4 out of 5 stars. I liked it immensely. It’s beautiful and magical and offers a great opportunity to discuss multiculturalism. My final reservation, though, is that the publisher didn’t commission an Inuit illustrator. There are so many talented Inuit artists who could have been approached to work on this book. I understand the appeal of using someone established and familiar–but it left me with a feeling of cultural appropriation. You can find more information about this book, including other reviews at Goodreads.